I uum-ed and aah-ed over this bag for ages and finally decided to get it yesterday fearing that the last one would sell and be forever gone from my grasp. Of course, I went past the store today and saw they got a whole bunch of new ones in on the shelf. In a better colour. 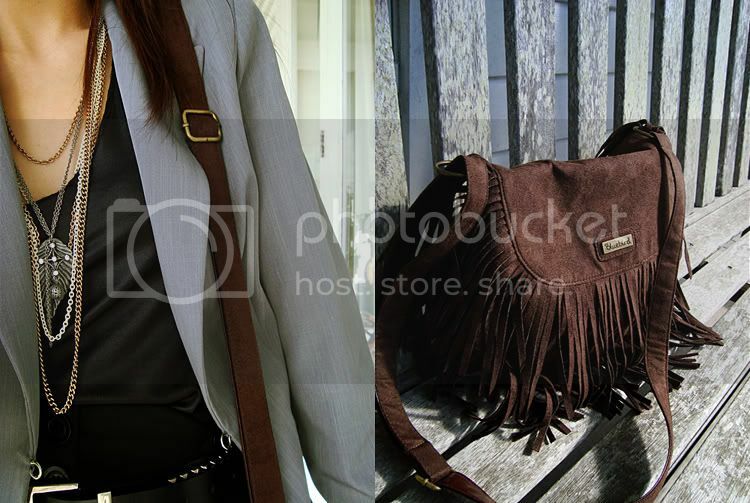 Blazer & belt, vintage. Top & skirt, Supre. Shoes, Glaze. Chain necklace, f21. Cross necklace, Farmers. Bag, Strandbags. Ciao bella :) Btw i do hope your test went fairly alright for ya! i'm still looking for the perfect fringe bag. and i know it's coming. You look great, love the necklaces! I love these photos, the focus and the lighting, do you do a lot of photography or was this just a really lucky shoot? Do you live in the house? Because it looks so lovely with all that white weatherboard and french doors, I am extremely envious. Where in New Zealand are you?